Who is often afraid should not go to the amusement park. Or actually he can, because apart from dangerous houses of horror and high-fueled trucks, even safe attractions can be found. You can stay away from terrible creatures and fear. In that case.. Who could refuse weekend in one of these flashing and noisy places? We get invited to such a visit thanks to board game Coney Island, which is set to environment of carnivals and was prepared by Michael Schacht. 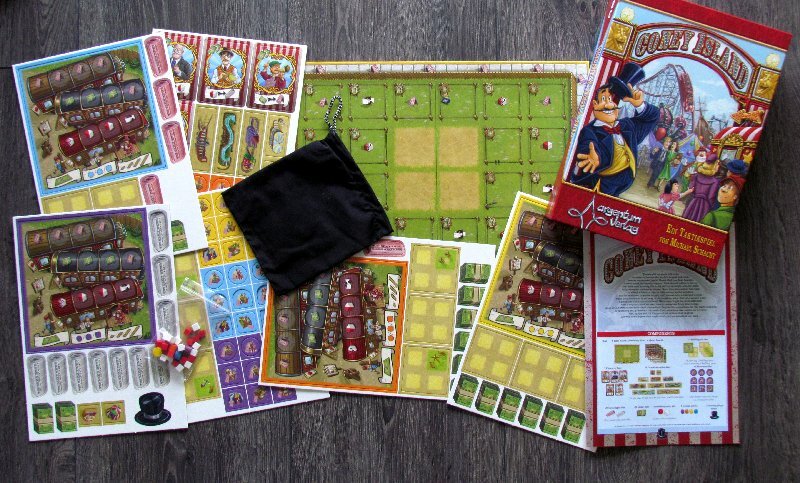 Game is published by successful publisher, Argentum Verlag and got completely illustrated by Dennis Lohausen. It ranks among their first games. That also brings out question, whether we still need another game about fun parks after Steam Park. 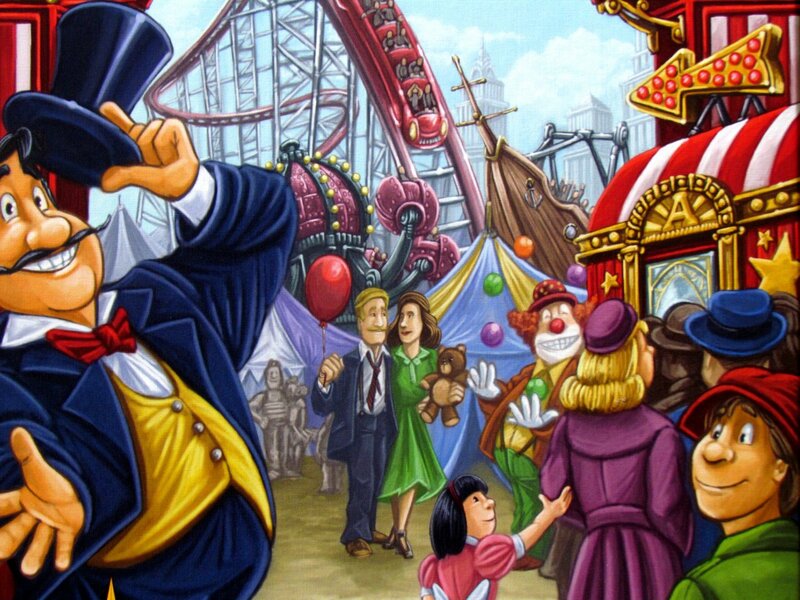 But Coney Island was published back in 2011 and therefore should be something to remember. Red oblong box welcomes us and lets us peek inside the gate, where people seem to be having great fun. Inside the box, players can take folded game board with two dozen areas for construction in the form of enclosed square spaces. 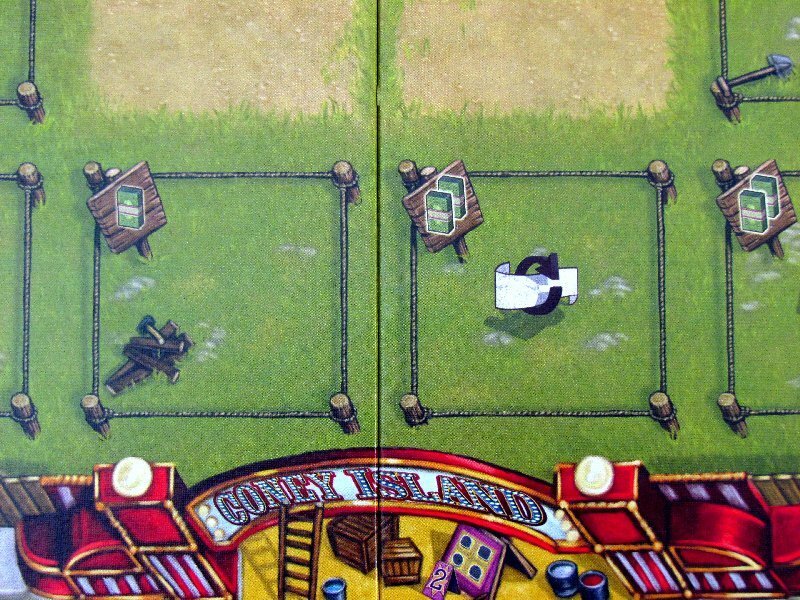 Players put randomly drawn attraction tiles on the center position without grass. 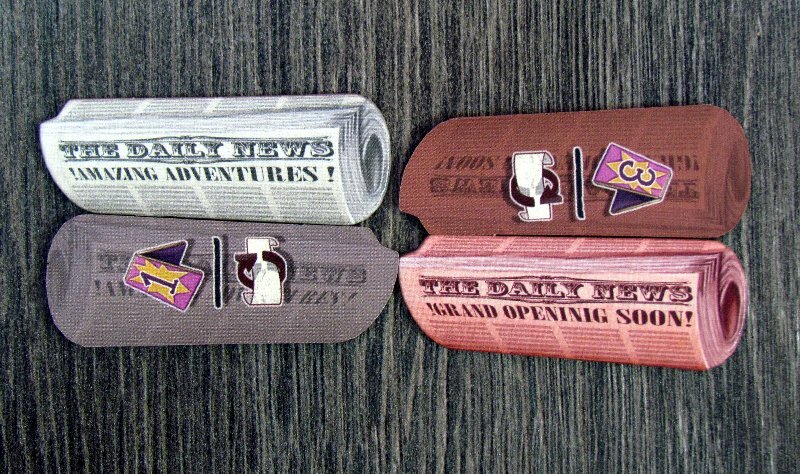 Attraction tokens are placed near the board, as well as newspapers, money tokens, plate of characters, wooden materials and remaining buildings. 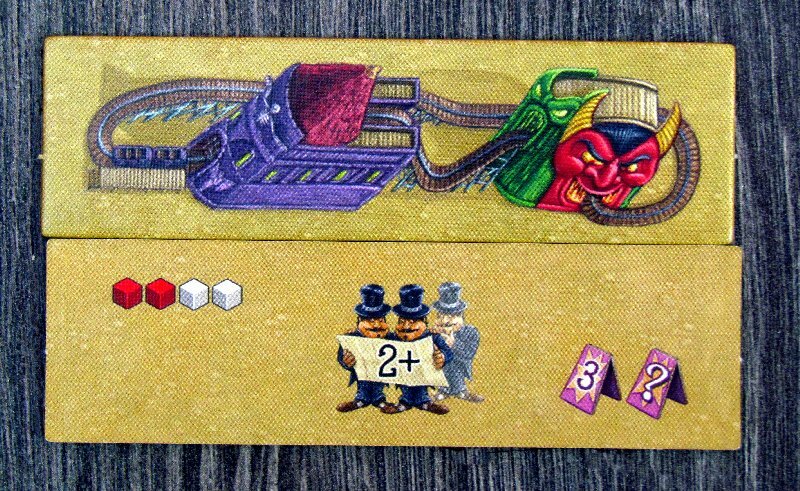 Each opponent gets one small board just for him, showing three caravan. This will be his home during construction of a common theme park, on whose completion will participate all families. 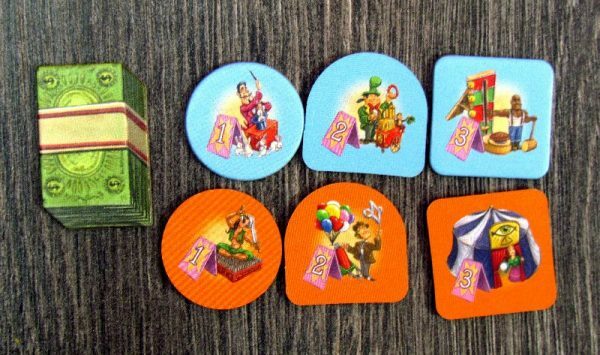 Players choose their color and role, get nine pieces of showmen (which are moved into individual trailers), one round scoring tokens (placed on scale around the board), two pieces of banknotes and one cube of building material. 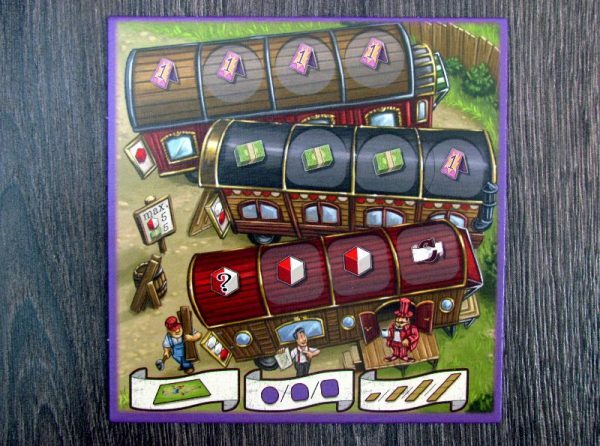 At the beginning of his turn, player earns revenue, that will flow to him from all vacancies on his caravans. In first turn each carriage brings players one resource of its type (money cube and attraction points). 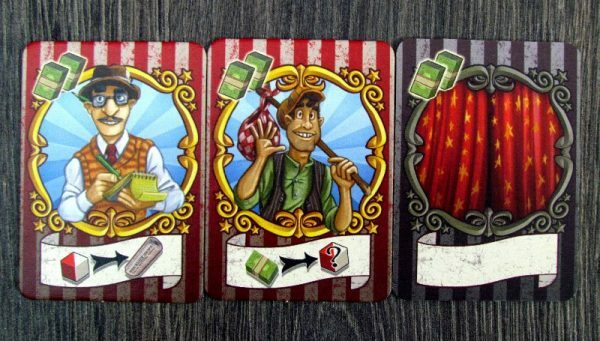 Income is immediately followed by the action phase, in which players get chance to next greenfield for building. Acquisition of new territories is paid for with banknotes, but he will receive points, material or other benefits printed on that given tile. Only such processed and prepared sites can harbor some showman. Player can move his character from any car, but always only from leftmost filled position. Price shown on the door of the caravan has to be paid (one to three cubes). 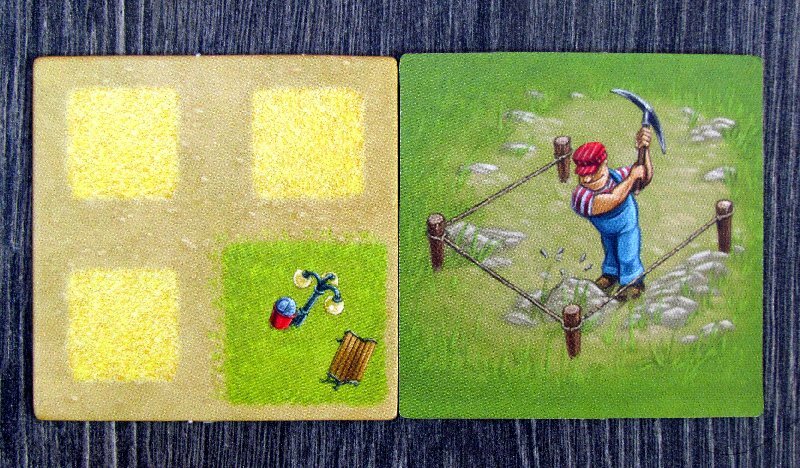 Only by using these helpers on building sites (and even those sent out by opponents), players may place a tile for one of the big attractions. Again, pay the price of cubes, but points for attractions are split among all, whose workers participated. But while active builder gets the value on the left, the others will get at least a consolation prize. Showmen are then returned to their huts and can be reused. For two saved bills can a player get character tile, whose actions will then be able to him for free use in his turn. However, these employees will not serve players forever, but only until they are paid by someone else. These figures allow players to exchange or obtain diced material, which players may be lacking. Game ends, when someone reaches target score (sixty points), building spaces are filled or stocks of tiles is exhausted. 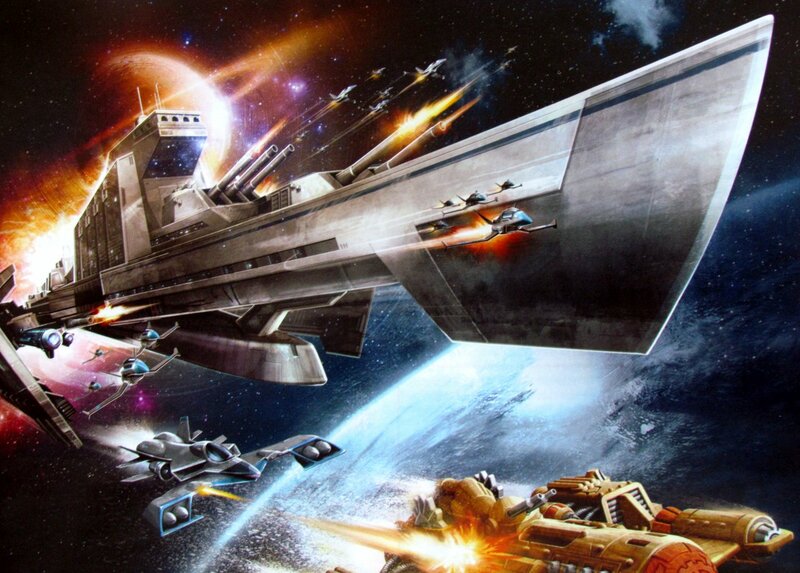 Now players can get a couple of additional victory points for capital, which they languished throughout the game. Winner is the one, who has gone furthest on the scoring track. Coney Island is classical strategy game, in which you count points one by one. Perhaps it could be labelled old-fashioned, which may be good news for some and not as much for others. 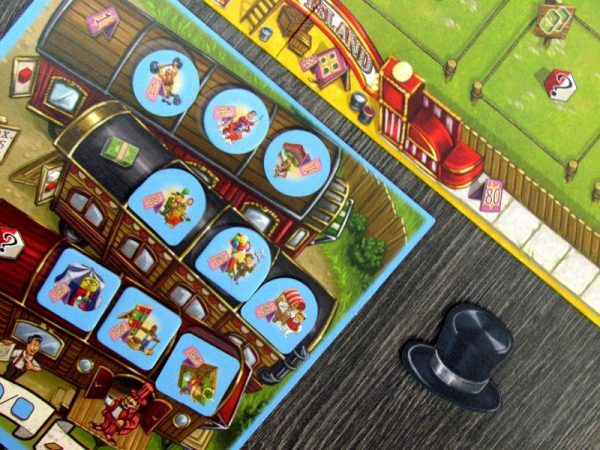 The game had held to all those classical euro recipes, which make battle for victory most tactic-full. In this game cannot be found even a pinch of luck. 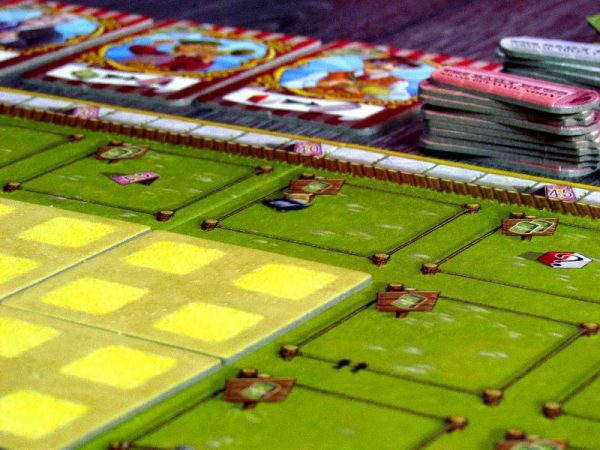 All purchases are predetermined and even paying for the creation of building spaces – they are printed directly on the board. 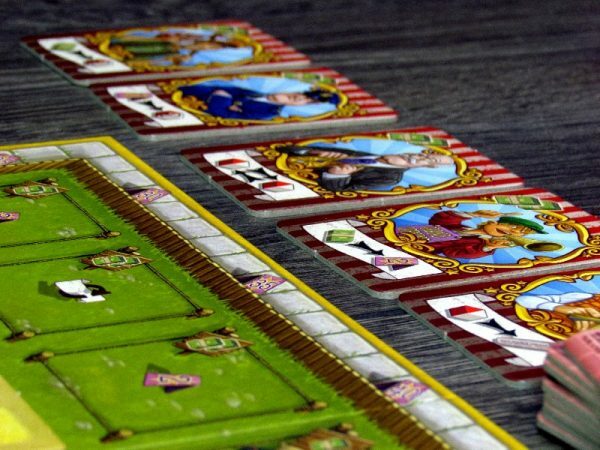 Unfortunately, it carries with it one significant drawback – game is in fact quite similar, whether you play for the first time or fifteenth time. Construction of attractions is resolved well over figures of showmen. As a result, players can plan ahead, but also can use opponent pawns. Those deemed to receive partial compensation in the points, but not nearly as much as the actual builder. It is therefore important to be the first and thus create the most efficient shapes out of your own pieces. 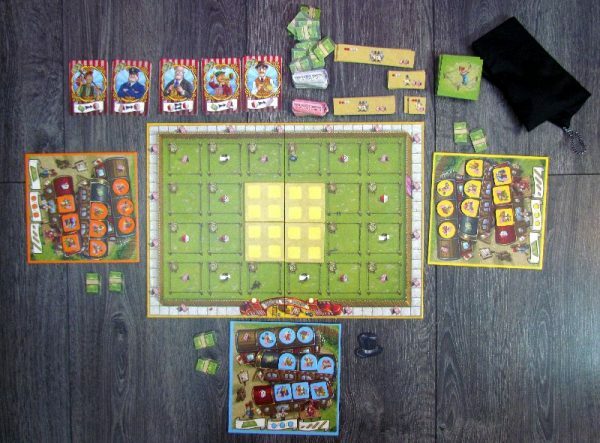 Tacticallity includes not only higher demands on the players, because it is certainly not suitable for younger players, but mainly higher playing time. It usually exceeds 45 minutes, but the winner will definitely be known before end of one hour. Game works with all counts, because players can not significantly influence each other. Game contains a number of other interesting elements, that make of it an object of interest for many players – worker placement reveals spaces on caravans, that affect your revenue. And there is more than enough chances to spend all resources. For the players, there are several ways to earn points. But in the end, all are pretty similar and related to each other. Processing is solid, but not exceptional. Wooden cubes are nice and illustrations are thematic, but it’s all quite normal. This also applies to theme, that does not bring you into a trance. Actually, it could be game about building anything else. 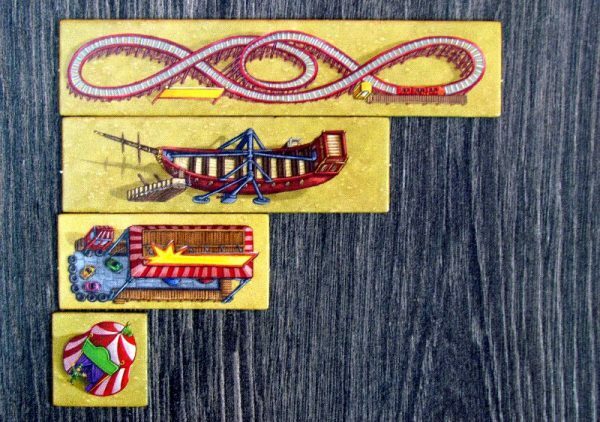 Coney Island is not a game, which would be a queen among building games. It is significantly tactical, which gives it brownie points, but it is too dry and serious. And this is an obstacle on its path to greater success. Game works, entertains, but does not excel. Coney Island will appeal only to a specific audience. 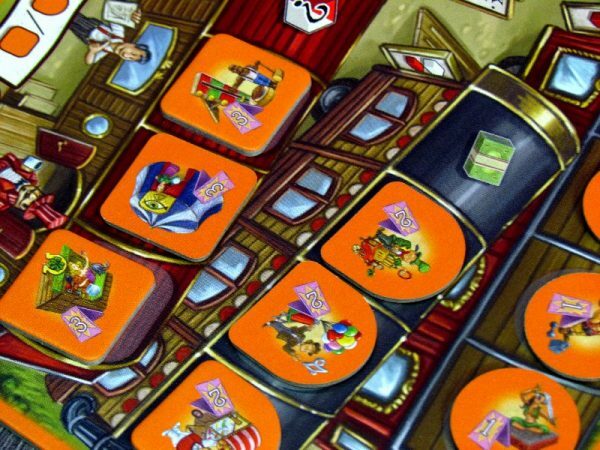 Coney Island is certainly not included among games, that will take your breath away or which should you take on vacation in your backpack. 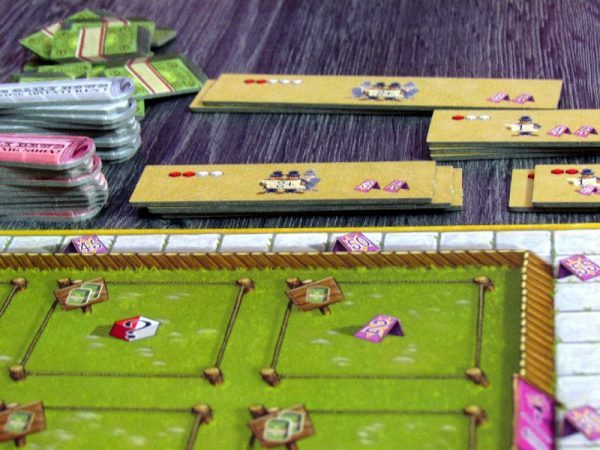 The game is good and it works exactly as it should, but it is not enough in today's competition. It certainly entertains those, who buy it intentionally. 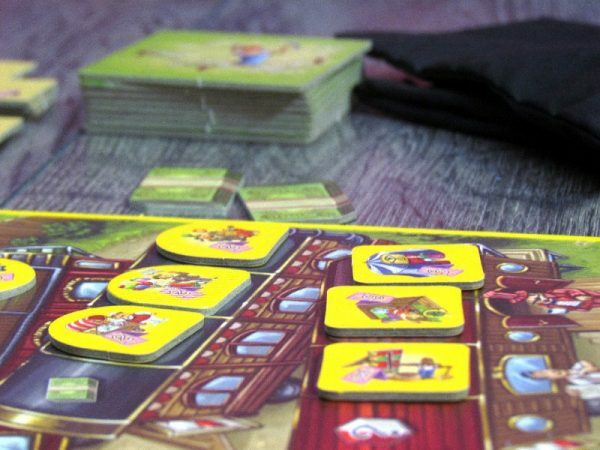 It offers solid and thoughtful euro fun with appropriate processing. But it lacks something extra. Coney Island falls rather average.